May is Illinois Invasive Species Awareness Month. Learn how to identify and pull garlic mustard, a non-native invasive species. Anyone interested in caring for the natural environment is welcome to participate. Volunteers may arrive at any time and work for all or part of this time period. All ages will enjoy participating in this community service land stewardship day. It is a great outdoor activity for individuals, families, Scout and 4H clubs, homeschoolers, church, school and corporate groups. 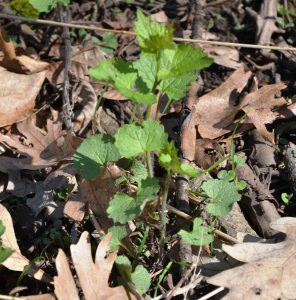 Learn how to identify the non-native, invasive garlic mustard plant and the best way to pull it from the soil. Volunteers will play a vital part in the conservation of this unique natural area. Dress for the weather. Gloves, long sleeves, pants and sturdy shoes are recommended. Snacks and water will be provided. Location/Parking: Burr Oak Valley Preserve is located at 7405 Elevator Road in Roscoe, IL. Limited parking will be on site. Look for flags at the entrance (south side of road, one tenth of a mile east of Cross and Crown Lutheran Church, 7404 Elevator Rd., Roscoe, IL 61073). Additional parking is available at the church. Registration requested for this FREE activity by Friday, May 3.